Way back in 2010, the phrase “there’s an app for that™” was so buzzworthy and ubiquitous, Apple trademarked it. Today, even though Apple owns the phrase, the fact still stands that if you need something, there’s probably an app to assist you with it. This is even true for paying off debt. Debt trackers, loan apps, payoff debt apps… if you’re carrying debt, technology can assist you—right from your phone. And if you live in America, the likelihood is that you are carrying at least some debt. According to statistics by the ​New York Fed​ , ​total household debt— which includes mortgages, student loans​, car loans, and credit card debt —hit $13.5 trillion in the last quarter of 2018. According to a TIME analysis of the New York Fed data, those ​under the age of 35 carry the most school debt, with the average millennial household owing $14,800 in student loans. Those between the ages of 45 and 54 had the highest amount of debt overall, at an average of $134,600. And that number is concerning to many, as it may mean more young people will carry debt well into old age. Fortunately, there are ways to prevent student debt from following you forever​. The plethora of apps available that assist with debt management include debt tracking, debt analysis—there’s even one that helps pay off debt with the spare change in your pocket. Here are five loan apps that may help you get to the debt-free finish line faster. ChangEd , ​an app started by Nick Sky and Dan Stelmach, aims to help everyone pay off their student loans one penny, nickel, and dime at a time. The app works by linking to all your credit and debit cards. With each transaction a user makes ChangEd rounds up to the nearest dollar value. It takes the extra change and sends it directly to the student loan provider. It’s all automated, making it super simple to pay off your student loans just a little bit faster. The Debt Payoff Assistant app is a frills-free way of tracking all of your debt in one place right from your pocket. The app’s design makes it easy to see where you could be paying off more debt and just how much time it could take. The app also shows different payment plan options to see which one might work best for your personal needs. Users can even make sure they are paying their debt off on time by setting regular reminders of when their bills are due. Undebt.it is a debt calculator that allows users to track all of their credit, debit, student loans, and mortgage loans in one place. Plug in your information and choose from six repayment options or customize your own plan. Two of the most popular plans are Debt Snowball, which pays off the lowest balance first and Debt Avalanche, which pays off the highest interest rate first. If you’re unhappy with your current plan, you can switch back and forth between options. The app also allows users to see just how much sooner an extra payment can make them debt free. Like Undebt.it, ​Unbury.me is a debt calculator that allows users to track all of their debt in one place, though Unbury.me has the advantage of beautiful graphics that make sense to even those of us who aren’t money geeks. The Chrome-enabled app allows users to explore different repayment options and can give users concrete dates on when their debt may be eliminated if they follow the different strategies. Best of all, you don’t even need to log in or create an account to see how the different methods work. If you’d like to keep track of all your debt, however, you need to create an account and link your services. ​Debt Payoff Planner works like all the other apps above. It allows users to input all their data, track their debt, set up repayment alerts, and compare payoff strategies. The app also goes a step further and looks at your habits and budgets to show you just how much extra you could be paying toward your debt each month, and in turn possibly get debt free sooner. It will even recommend articles to read so you can further educate yourself about personal finance. As you work towards hitting that zero on your debt, you may want to consider taking advantage of the apps available. From tracking your total debt to ensuring you’re paying it off on time, they can help you find ways to get debt free with less headache. They could even help get you debt free faster. 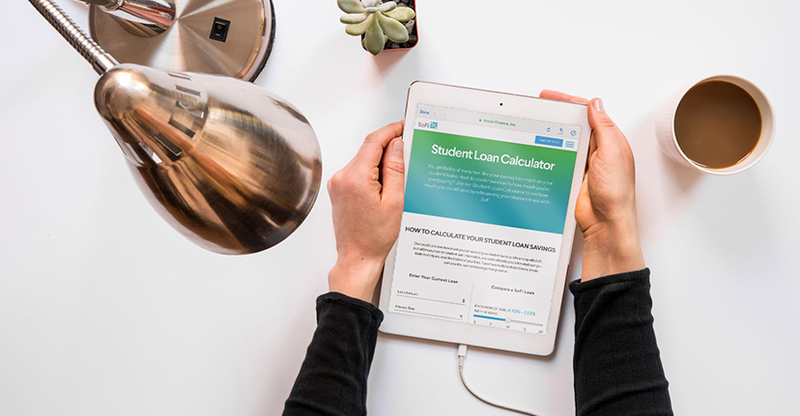 And while the app you choose is downloading, check out ​SoFi’s Student Loan Refinancing Calculator​, which shows you just how much you could be saving by refinancing your student loans with SoFi. Through refinancing your student loans, you could save on interest, which could help you pay off your student loans​ faster. All of that could lead to serious savings that could be better spent elsewhere. Thinking about consolidating your debt​ or ​refinancing your student loans​? SoFi can help you get out of debt sooner than you think. IMPORTANT: The projections or other information generated by the SoFi Student Loan Refinancing Calculator regarding the likelihood of various financial outcomes are hypothetical in nature, do not reflect actual investment results and are not guarantees of future results.